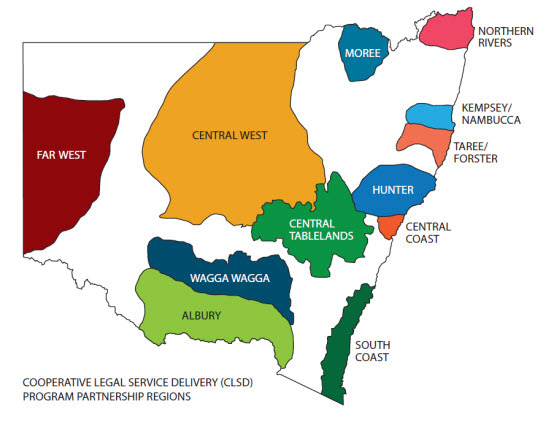 The CLSD Program comprises twelve justice partnerships in regional and remote NSW. Each partnership works to address unmet legal need and to achieve better outcomes for vulnerable and disadvantaged people in regional, rural and remote NSW. How does the CLSD Program work? How can you get involved? The CLSD Program Regional Coordinator in each region facilitates local coordination, supports local projects and convenes four regional partnership meetings each year. Each CLSD Program region has an action plan that sets out local priorities. The action plan is based on ideas generated by the regional partners and the evidence contained in the CLSD Program Regional Profile that is prepared by the CLSD Program Unit. The CLSD Program provides funding and other support to regional projects to address unmet legal need. Traffic clinics at local courts. Contact the Regional Coordinator in your region to find out how you can get involved, or contact the CLSD Program Unit at Legal NSW. You can sign up to the CLSD Program e-update here. These Profiles are prepared by the CLSD Unit using data from sources such as the ABS, the NSW Bureau of Crime Statistics and Research, the Law & Justice Foundation and publicly available government agency data. It also includes localised service survey data and reported legal needs compiled before CLSD planning days. Some of the content of the Profile includes analysis by the CLSD Unit. They are a point-in-time and selected snapshot and should be used with this in mind. The Law and Justice Foundation has updated CLSD Program data packs combining ABS Census 2016 and Data Digest 2016. The data packs include the need for legal assistance indicators (NLAS) for Local Government Areas within each CLSD Program region in table and map formats. The data is useful for planning and coordinating legal assistance and related services. The CLSD Program unit at Legal Aid NSW provides administrative and strategic support to the regional partnerships.